Script help and awful CSS magic by Joe Rayhawk. Nop! I mean no! They are taking over! We must stop them! Now this one is freaking funny…. Inside humor, subtle references, contemporary parody, and more inside reference humor. How could I ask for more? You’re a bright young man, James, but you have got to lay off the sauce. That is absolutely superb — although typing a comment is proving to be an adventure! is everyone fully appreciating the “rosebud” reference? Heheheheh! Excellent strip! Who’s that on the shirt btw? Daniel J. Bernstein, the guy who believes UNIX is so insecure that he needs to reimplement it piece by piece. Other than the Citizen Kane reference? I am reimplementing DJB’s programs in short, readable shell scripts. 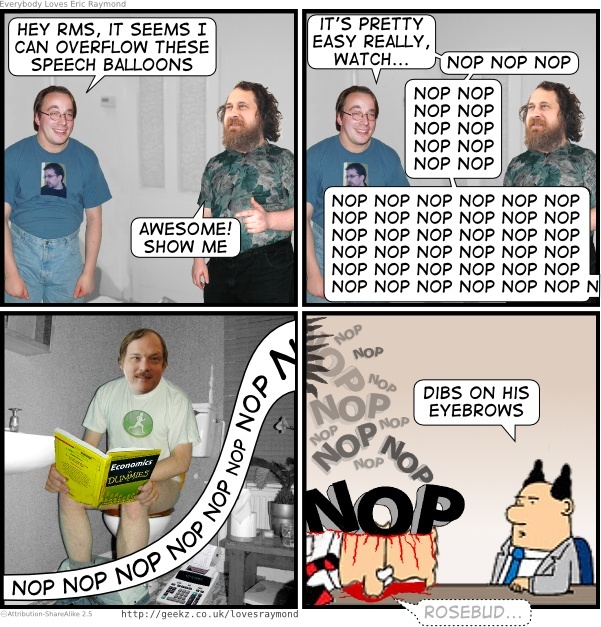 nop nop nop nop nop nop nop nop nop nop nop nop nop nop nop nop nop nop nop nop nop nop nop nop nop nop nop nop nop nop nop nop nop nop nop nop LOL!! It’s the guy who wrote qmail. He’s an enemy of our freedom. hmm, don’t get the rosebud ref…what do these guys have to do with this great film ? ESR finally gives us some new material. Yeah, although I prefer the responses, really.